There hasn't been much activity in this topic since early October, so I'll post this about my latest rifle build and prairie dog shoot on November 13, 2018. The last prairie dog shoot I was out on was back on August 21, 2018, and I was suffering withdrawal symptoms from not feeding my NEED to shoot prairie dogs!!! 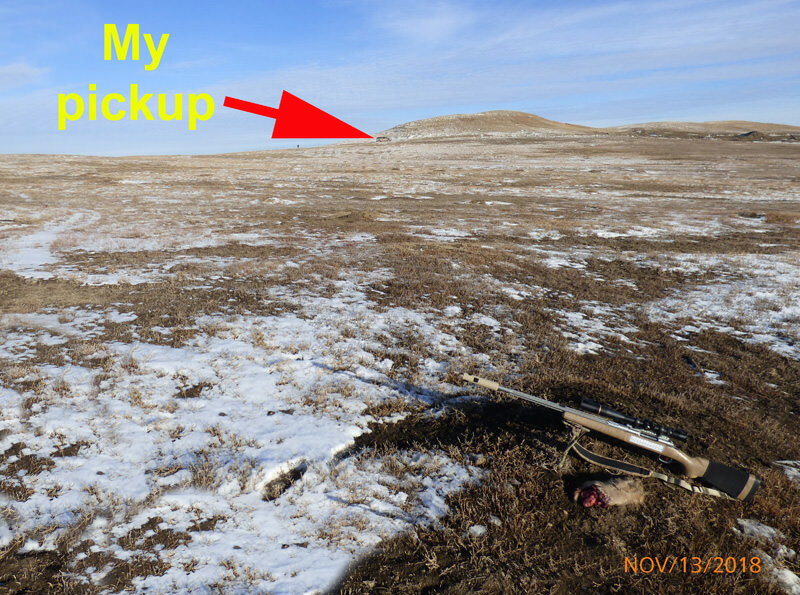 I had been watching the weather forecast for a long time, looking for a day when the temperature would be in the 20s or 30s and the wind would be down below 10 mph so I could venture out and give my new 20 VarTarg rifle a try at dispatching prairie dogs. Well, that day came last Tuesday, November 13. I had to take care of some chores around home, but when 1:00 p.m. arrived I gathered up my gear, put it in my pickup and was headed out of town at 1:18 p.m. The wind was a bit brisker than the forecaster had promised; blowing 8 to 15 mph, but it wouldn’t be the first time I shot when the wind was blowing!!! The temperature was 39º when I parked my pickup on the north end of the dog town and did get up to 41º for the high temp. It was VERY muddy out in the dog town which made walking on hillsides very treacherous!!! It was so muddy that lying prone to shoot was not even a consideration. I used my Caldwell DeadShot FieldPod and a little three-legged stool to stay up out of the mud. I have had a Savage Target action in my arsenal for a number of years, but it had a .204 Ruger barrel on it. It is a right bolt/left port single shot. I decided to use that action on which I would build my 20 VarTarg on. Back in 2015 when X-Caliber started making barrels one of the varmint boards worked out a group buy on those barrels and I ordered two 27" stainless steel three-groove 1 in 11" twist .204 caliber barrels so I could have them finished at 26" if I desired. I had X-Caliber Barrel & Mfg. contour the barrels so they start out at approximately 1.250" at the breech, go straight for 3" and then there’s a straight taper down to the muzzle for a .800" finished muzzle. I had my gunsmith finish the barrel at 24", cut 5/16" flutes on the barrel, and thread it on the muzzle for my suppressor and the barrel is still a heavy load!!! Here’s a look at the rifle. My gunsmith finished chambering my barrel and had the rifle ready to pick up on August 27, 2018. Two of the powders mentioned frequently for use in the 20 VarTarg were H4198 and AA2200. I tried to find those two powders but there didn’t seem to be any around this part of North Dakota. I finally found the H4198 in Bismarck, ND in June and found the AA2200 at a little gun shop in Bismarck, ND around the middle of September. I was also busy buying brass and dies (very expensive dies) for this project. At one time I bought 500 brand new Lake City 5.56 casings and a friend of mine was willing to form them to 20 VarTarg specs for me. When I read about all the work required to form them, I decided to buy Lapua 221 Fireball brass. The 500 Lapua 221 Fireball casings cost around $350 with shipping and the 500 Lake City brass casings cost $152. That caused a bit of sticker shock, but the forming process, at least for me, has been very easy. The friend who volunteered to form the Lake City brass for me has a Neil Jones forming die with all the nice bushings he loaned to me so the forming process has been going GREAT for me. Very few shoulder folds and I get nicely formed brass before doing the fire forming. The formed casings shoot about the same accuracy as the fire formed brass. By October 20, 2018, I had 400 of the 500 casings formed and had used 119 of them for testing loads. I wound up getting shoulder folds in 4 of the 500 casings, one of those is severe enough so I won’t load it, and the other three have been fired one time, but retired from service. As of now, I have used fired 227 of my 221 Fireball Lapua casings formed to 20VT. I have 72 formed casings loaded and waiting to be fired for the first time and another 200 casings waiting to be loaded and fired. The bullets I have tried are the 32 gr. V-Max, 32 gr. Sierra BK, 32 gr. Nosler Varmegeddon, and the 39 gr. Sierra BK. I have some 40 gr. V-Max that I use in one of my .204 Rugers and a bunch of 40 gr. Nosler BTs that I used in my old Savage 12VLP with good accuracy. Here’s a scan of the target from the load I wound up using for my first prairie dog outing. 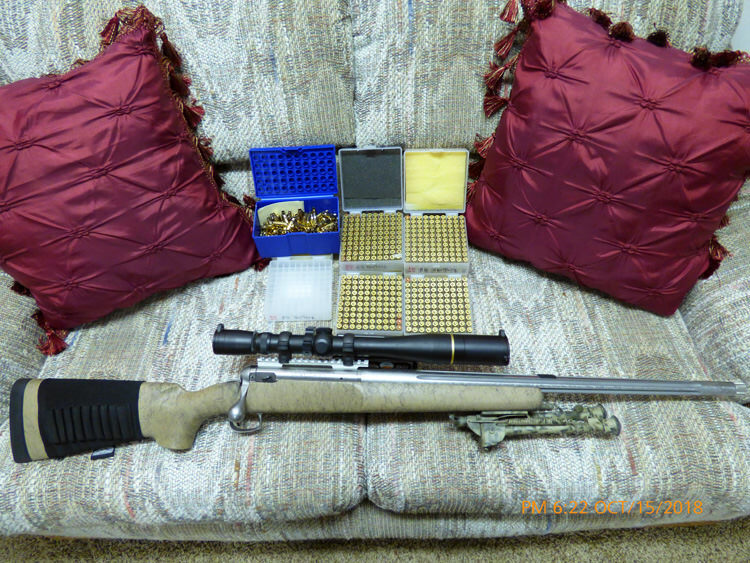 Here’s a look at the rifle and some of the casings I have worked with. So, back to the prairie dog shoot. There were lots of prairie dogs up out of their dens, but they were very wary. I had a few of them stay up out of their dens at distances of 25 to 75 yards and they paid with their lives. Most of my shots were in the 100 to 191 yard range. Here’s the view from one of my victims looking back to where I parked my pickup across the snowy PD town. As I mentioned earlier, it was very muddy and the wheels of my little Schwinn cart picked up lots of mud and snow and needed to be scraped off before I lifted the cart into the back of my pickup. Here’s a look at the last prairie dog I shot near the end of the day. The wind had died down and this fat little fellow was on the side of his mound and standing on all four legs with his back to me and I ranged him at 191 yards. The Caldwell DeadShot FieldPod is fairly steady for up to 150 yard shots, but for anything over that I’d rather be lying prone. Anyway, I got steadied up and squeezed off the shot and could hear that familiar WHACK sound and saw him slump down. I walked over to him and saw a very tiny red spot on the top of his rear end where the bullet entered and when I turned him over I could see that the bullet exited his chest. I only took 18 shots and killed 17 prairie dogs. I hate to admit it, but the one shot I missed was under 25 yards!!! My excuse is that I was standing, trying to rest my rifle against the side of a steel fence post and I knew I was wiggling all over the place and just plain blew the shot!!! I’m embarrassed!!! I apologize for not taking any photos of blossoming plants, but I never saw one. I do, however, have the infamous “Hero Photo” for your viewing pleasure. 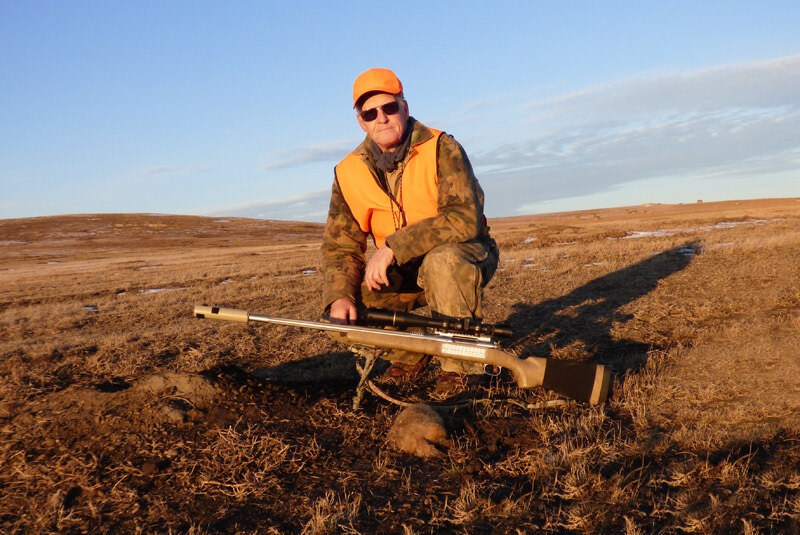 Our deer gun hunting season in North Dakota started on Friday, November 9, 2018, at noon. Deer hunters are required to wear a certain number of square inches of Hunter Orange clothing on their upper torso and a Hunter Orange hat of some kind. While I wasn’t out hunting deer, I felt it necessary to wear this garb to prevent some weirdo from shooting at me thinking I was a deer! The red tint to the photo is caused by the color coming from the red sunset. I hope you enjoyed the write-up about my new 20 VarTarg and the photos and story about my latest prairie dog shooting adventure. I know I enjoyed the hunt, but I paid the price because my back is very sore now. I’m scheduled to have a spinal cord stimulator installed on my backbone on January 9, 2019, for a 5-day test run to see if it is something I want to have installed permanently. This device intercepts pain sensed by the nerves before the signal gets to the brain. Sounds like science fiction, but I’m hoping and praying that it will work for me. Bill K--You and Varmint Shooter definitely earned the title of "Dedicated Squeek Shooters" for that hunting expedition. and it was still fun. Hope all goes well with the back.